Mashable notes: Over the past few years, social media recruiting has garnered a lot of discussion in the HR world — mobile recruiting, on the other hand, is a topic that has yet to make it into the mainstream conversation. Employers lack knowledge of how job seekers are using mobile devices and how their businesses could take advantage of the mobile web to find top talent. As a result, only a limited number of employers have implemented mobile recruiting strategies via apps and mobile websites, according to a study by online recruiting research lab Potentialpark. For the study, Potentialpark surveyed more than 30,000 job seekers worldwide and analyzed the mobile career presence of more than 350 top employers in the U.S., Europe and Asia. Since the data has not yet been published online, Mashable spoke with Potentialpark about its findings. The study found that a healthy 19% of job seekers use their mobile devices for career-related purposes (and more than 50% of could imagine doing so), yet only 7% of employers have a mobile version of their career website and only 3% have a mobile job app. One out of five job seekers may not sound like a huge deal, but it’s no number to scoff at. Since smartphone adoption rates are ever-increasing, this number will likely increase as more mobile users get the power of the Internet into their palms. So, what exactly are job seekers looking to achieve on their mobile devices? 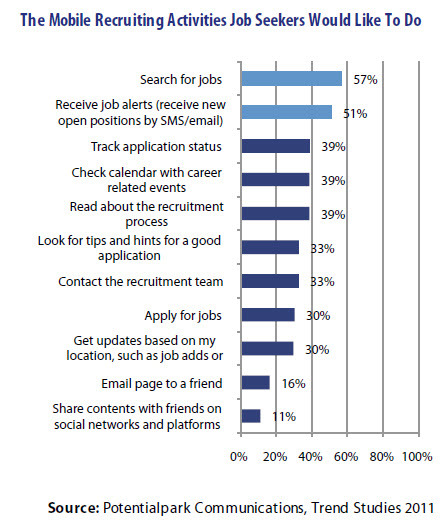 Potential recruits want to use their mobile phones to look for jobs and receive job alerts — but they have many other activities in mind, as illustrated in the graph below. While employers aren’t quite up on their mobile game this year, Potentialpark believes more companies will get into the mobile recruiting game in the coming year. In a separate Potentialpark survey of 150 employers, 75% of respondents stated they were planning to have either a job app or mobile career website by September 2012.